When he is not deep-sea diving or researching great white shark behavior, John McCosker's interests include aquatic animal evolution and discovering and cataloguing the fish of the Galapagos Islands. In 1975, the California Academy of Sciences sent McCosker and a team of oceanographers to Grand Comore, an island in the Indian Ocean off the eastern coast of Africa. McCosker's mission: to learn as much as possible about the coelacanth. Despite accidentally wandering into the midst of an insurrection against French colonialists, McCosker still managed to obtain two frozen coelacanths. The coelacanths were also preserved on 50 franc stamps issued by the Comoro Islands. Packing his specimens in dry ice, McCosker made his way back to the states, where he sold one specimen to his alma mater—the Scripps Institution of Oceanography, based in La Jolla, CA. That sale helped to pay for the expedition, enabling McCosker to dissect the remaining coelacanth. Both specimens provided researchers at numerous laboratories with an unparalleled opportunity to perform dissections, examine tissue, and determine if coelacanths were, in fact, the missing link between fish and amphibians. Unfortunately for the coelacanth, that special designation was not to be. “It was once thought that the coelacanth walked out of the water on its bony limb-like fins and became an amphibian,” says McCosker. “That designation now goes to the lungfish.” Today, the coelacanth is regarded as a still-living remnant of an ancient evolutionary line. However, McCosker notes with satisfaction, the coelacanth survives in the popular imagination as a form of insult in politics, where it is a term used to describe politicians too old, fossilized, and set in their ways to change. When John McCosker, Chair of the Department of Aquatic Biology, started his research on great white sharks, they were misunderstood creatures, living in the shadow of the movie Jaws. McCosker, who grew up surfing and scuba diving in Southern California, began to ask some simple questions: Are great whites really dangerous? What are the risks to swimmers? And why were attacks on surfers suddenly on the rise? In 1980, McCosker got a phone call from Al Giddings, an underwater filmmaker famed for his bravery and ability to capture rare underwater images. Giddings had been part of the 1975 expedition to the Comoro Islands that captured a coelacanth and the first-ever photographs of many unknown creatures. McCosker was the first trained marine biologist to swim with the sharks. McCosker and Giddings began their hunt for great whites off the coast of South Australia. Together in an underwater cage, they began studies that would transform the great white from a misunderstood, fearsome man-eater to a dominant and respected species at the top of the ocean food chain. Using fairly primitive materials, like barbed brass spear points, rudimentary radio transmitters, and long sticks with sharp points, the two men tagged sharks and inserted transmitters inside their musculature. They also examined shark body temperature and discovered that they are endothermic, meaning they generate their own body heat. 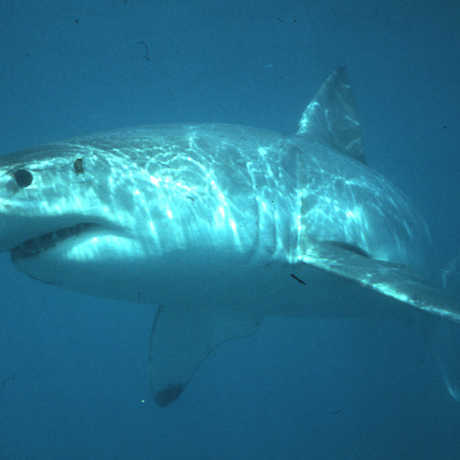 Along the way, McCosker came up with a theory about why humans (especially surfers) were attacked by great whites with increasing frequency. As surfing grew in popularity and matured as a sport, surfers sought ways to go faster. They adopted shorter boards with split tails for maneuverability. From a shark's point of view, the new surfboard design resembled a seal-sized lunch. In his decades-long career, McCosker has interviewed dozens of people attacked by sharks. But now the tables have turned, and sharks are under unprecedented attack by man. Millions of sharks are being killed each year, and one of the culprits is a cultural affinity for shark fin soup, which is popular in Asia. To acquire the main ingredient for the soup, a shark's fins are hacked off and the rest of it is dumped back into the ocean to die. Top level predators help regulate the population number of other species in an ecosystem. Once an important predator like that disappears, it causes what ecologists call a cascade effect. Sharks eat sea lions, and sea lions prey on salmon. But when sharks disappear, what we get is an abundance of sea lions that can decimate the salmon population, and then drop in numbers once their food sources have been exhausted. This imbalance can work its way down through the food chain. “Eventually,” McCosker predicts, “we'll have nothing left in the oceans until we get to jellyfish.” If the sharks disappear, seals will soon have nothing to eat. As counterintuitive as it seems, that's why even seals need white sharks. For environmental biologists, the Galapagos Islands remain deeply inspirational. Most of the species of finches and giant tortoise that Charles Darwin observed in 1835 as he wrote The Origin of Species are still there, undisturbed by man. Nearly 75 percent of all land birds and more than 90 percent of the terrestrial mammals and reptiles are unique to the Galapagos. Close to 96 percent of the endemic species living on the Galapagos at the time of Darwin are still intact. The Galapagos Islands are an excellent place for scientists to study biodiversity. Island ecosystems are isolated and thus easier to study than continental landmasses. Islands are a living laboratory where scientists can see evolution in action and study species that exist nowhere else in the world. As a marine biologist, John McCosker sought to study evolution in the waters surrounding the Galapagos. This was a world Darwin never saw. McCosker, currently the Chair of Aquatic Biology, has been to the Galapagos on several expeditions. With his filmmaking colleague Al Giddings, McCosker has ventured out in a deepwater submersible capable of withstanding the enormous pressure at 3,000 feet below the surface, on the bottom of the ocean floor. He's discovered previously unknown sharks, eels, skates, and scorpion fishes, including 35 species of fish found only in the waters of the Galapagos. Understanding and appreciating these graceful, fascinating creatures can help save them. The Academy is home to the world's largest collection of scientific specimens from the Galápagos.